We lost our beloved Puck yesterday. It was a complete shock and totally unexpected. It started Wednesday evening shortly before bedtime. We can’t sleep with our door open, mostly because of Chris, so we have to make sure everyone is out of the room before going to bed. I accounted for everyone but Puck so I looked under our bed and there he was. I got out the Stella and Chewey’s and announced loudly ” KITTY TREATS!” That got Chris, Frankie, and Floki to immediately run into the kitchen but Puck stayed under the bed. I assumed he wasn’t feeling well and I felt bad but I pulled him out from under the bed and set him on top of the utility cart in the kitchen. 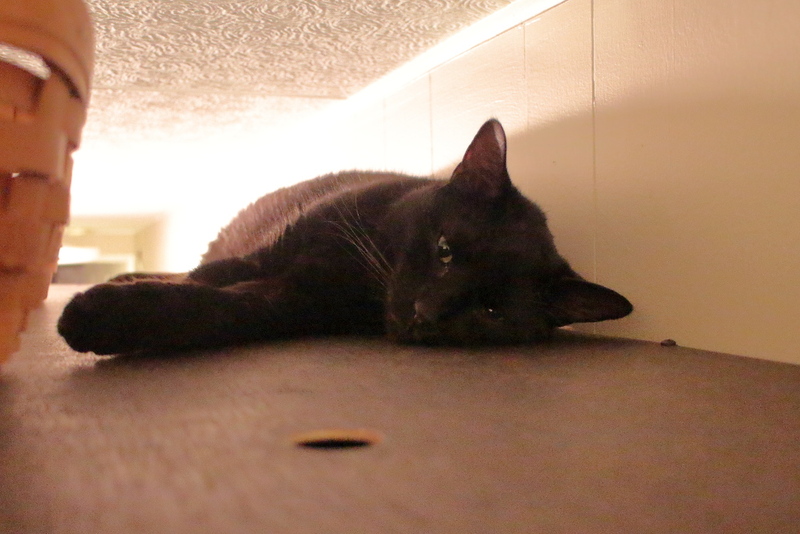 It was one of Puck’s favorite places to hang out, which is why we always kept a rug on top of it. But he didn’t want to be there. Instead, he jumped on my shoulders so I could carry him to the top of the china cabinet. He liked it there because nobody could bother him. I then went into the Florida room to shut the computer down. When I did I put my hand on the chair and into a pile of cat puke. I turned a light on and it looked like undigested food from dinner. In particular, Puck’s special food. It is usually Frankie who pukes, not Puck, so I figured he had the stomach flu or whatever it is that cats get. I thought if he was still sick in the morning I would try to get him in to see the vet. The next morning he was still on top of the china cabinet. He hadn’t moved from that spot all night. That definitely wasn’t good so I called the vet when they opened at 7:30. They said to bring him in at 8:20. I had to get a step stool to reach him and at 8:00 I pulled him down and put him in his carrier. We were at the vet by 8:10 and they put us in a room right away. I opened Puck’s carrier but he just lied there. The vet tech came in and took Puck to the back room where they do their secret experiments. She then brought him back and the vet came in and examined Puck. The vet said his bladder felt full and he could be blocked. She tried to get some urine out of him but couldn’t. As we waited for lab tests the vet drew up a treatment plan which was going to require Puck to be there overnight and possibly for a few days. I don’t remember the details but she did say something about a catheter. 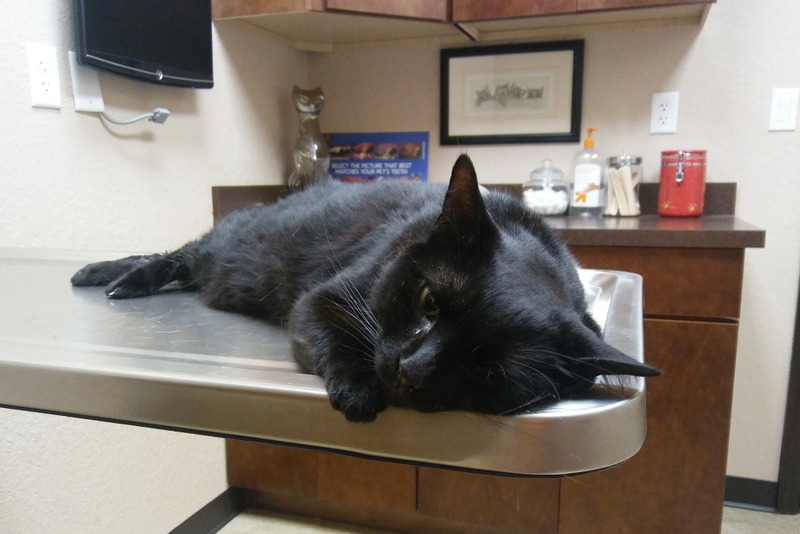 As we waited for the vet, Puck was lying on the table and he looked so weak. I stood there and petted him for a long time until the vet came back with a list of treatment options and cost, which was not cheap. We then left Puck at the vet. I was in the car with Rose an hour later when her phone rang. It was the vet. We assumed they were calling to give us an update on their treatment plan because some of the options were dependent on unknown factors at the time. Instead, we heard that Puck’s heart had stopped and they were performing CPR. That hit us both like a brick. We were not expecting that. If we were home we could have been there in three minutes but we were twenty miles away in Tampa. We could only hope that they could revive him but we weren’t hopeful from the tone of the call. About a half hour later we got the call that he was gone. It is always sad to lose a pet but to lose one so suddenly at only five and a half years old makes it even harder. It also didn’t help that it happened on the anniversary of my father’s death. Whenever something bad happens I figure out ways to blame myself. Maybe I should have brought him to the emergency vet the night before. Maybe I should have thought not cleaning pee off the floor for more than a day was a bad thing. The vet said he was there six times for the same problem. Perhaps I should have brought him to a different vet sooner. I wanted to on visit number five. Puck had seen another vet for his excessive licking problem and that vet was more holistic, which is what I want in a vet, but he was also quite conventional too and not afraid to dole out antibiotics. The problem was that vet was much harder to get an appointment with and didn’t open until 9 a.m. while Puck’s current vet opened at 7:30. I should have risked it. I also became more diligent about getting Puck to eat his special food. I stopped mixing it with the homemade raw. The food was supposed to eliminate the crystals, not make them worse. I did have a thought about a while back that if the vet was wrong about the type of crystals Puck had then the food could make them worse. I thought about asking the vet what type of crystals they found in his urine but then thought that would be insulting and chose to trust they knew what they were doing. I don’t want to place blame on anyone here. Sometimes bad things just happen and I do know the people at the vet’s office are very caring people and I also know I am not perfect but not because of lack of effort. What I want is to say I appreciate everyone who has been so supportive and caring since learning about Pucks passing. It is good to have people who understand and care. I will post more about Puck’s life sometime next week. I hope you will take the time to remember him with me. This entry was posted in Uncategorized and tagged blockage, cat, Puck, RIP, urinary tract on February 16, 2018 by Charles Huss. We are so very sorry. Rest in peace, Puck. I am so very sorry for your loss. Sending you deep rumbly purrs of healing and comfort. It is so very easy to look back on the decisions made, especially when you don’t have all of the information in front of you, and question everything and try to throw blame around. That stuff is horrible and lands everywhere. Differentiating between the two types of crystals that cats get is very easy. Most cats get struvite crystals and vets give out CD, SD or SO foods. Do not question if you gave the right food, that one is easy to know that the vet picked the food that the big pet foods suggest for the type of crystals he had. A lot of cats still get crystals even while on the Rx foods. 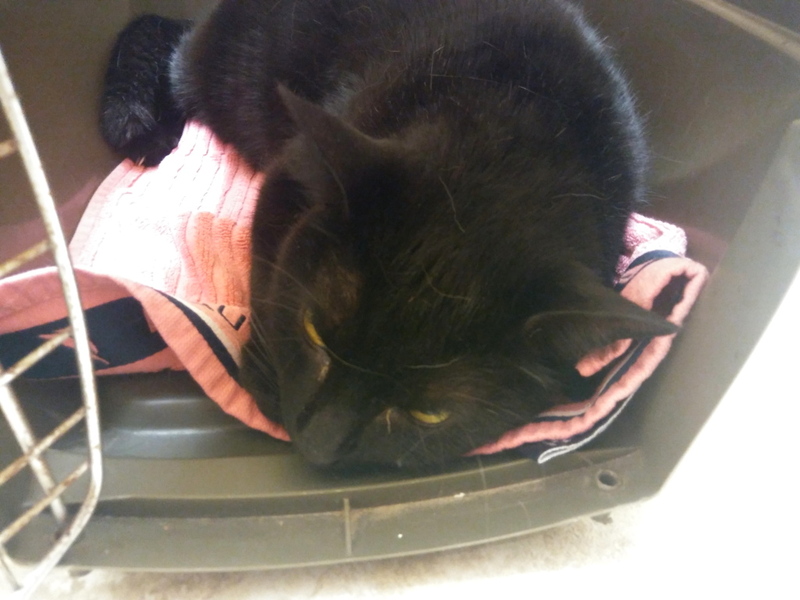 It is a very difficult disease and cats are VERY good at hiding illness and when they are part of a multi cat household it is even easier for them to hide it. There is no way to know who vomited. There is no good way to monitor if the cat is peeing a little bit more or a little bit less or a little bit more frequently. Now that I’ve said all this, I know full well you are still going to beat yourself up it is human nature. We want to pretend we have control over things and we could have saved them if only… Unfortunately, that is rarely the case. Hindsight is 20/20, isn’t it? I think Puck was given the cd food but Puck drank very little water compared to our other cats. I told my wife yesterday that I was going to start mixing some water with Puck’s food when he came home. I guess that will be a lesson for the future. By the way, thanks for your kind words. I’m so very sorry to learn about Puck’s passing…..he obviously did have issues but you are not the expert – we have to rely on our vets for that expertise and maybe they just fell short of assessing the seriousness of his issues in the past OR maybe things just got suddenly worse. But in any case, Puck’s heart couldn’t keep up with things bless him….It’s beyond tragic to lose a pet so young too – and when you couldn’t be there with him – but just remind yourself it is NOT YOUR FAULT. Animals have their own timetables I think…..Puck certainly had a lot of ups and downs….it was his time. I’m so sorry for your loss – Puck had a wonderful home thanks to you and Rose. Thank you, Pam. That is nice of you to say. So sad. You care for all your kitties so diligently and thoughtfully and lovingly – Mom and I forbid you to blame yourself. Puck had a wonderful (if too short) life with you. He was well-loved. RIP, little buddy. If you forbid it than I guess I won’t. 🙂 Thank you. Thank you. It helps to have friends who care. What a shame and so young. This is life’s blows and it does blow! You have the memories of Puck which will live with you forever. I know how you feel, I tend to blame myself also. It doesn’t do any good. I just feel bad that I’m not superwoman but in the end you did everything you could. Thank you. Now I will think of my dad and Puck together. We are so very sorry to hear about Puck. Sending you all comforting purrs and hugs. Our purrs, prayers, and thoughts are with you. Please do not blame yourself. We never know what may happen or when. Sometimes, sad things happen for a reason, even if we don’t know what that reason is. You gave your Puck a life filled with love, and now you will always share those memories with him. For what it might be worth, I used to work at a cat clinic, and urinary blockages, unfortunately, came through our doors frequently. We would have cats come in blocked even though they were on diets formulated to help prevent such issues. Urinary blockages can lead to elevated blood potassium levels, which in turn can result in cardiac arrest. Please do not feel as if you did anything wrong. Some things are simply out of our control. Your Puck will always be with you. I’m here to pay my respects to Puck and not to dole out blame. *bows head* Our Chizzy used to get crystals even on special foods. We knew cats could die if they couldn’t pee but it’s very hard when you work and have more than 1 cat to know who’s doing what. Nip happens. We are sorry for your loss of sweet Puck. Thank you. It doesn’t help now but life does teach you lessons for the future. So very sorry to hear that! We share your grief! oh my, that is so sad. So sorry for your loss. I am so sorry for your loss. Please don’t blame yourself. All we can do, is give our furry friends, a good home, and plenty of love. I can see you gave Puck both. I wish you the best. Chuck I am devastated beyond words. When I saw the title of your post I literally screamed out loud to tell my husband to stop talking because someone’s cat had died. I am just shocked and my heart is beyond broken for you and Rose. Oh how we loved Puck as we love all of your kitties. 5 and a half years old is much, much too young……….please, please do not beat yourself (you didn’t do anything wrong)…………and I know you have a good Vet. We all second guess ourselves so much of the time………..I wish there were something I could do for you and Rose……I don’t have the words that adequately express my grief/sorrow and how deeply I hurt for you both. I am sooo sorry. Sending prayers of strength and much love. Caren, you have always been so supportive and I really appreciate you. I’m so sorry and sad to read this. The sudden losses are the hardest. You gave Puck a wonderful home and that is what matters. Sending hugs and sympathy. Thank you so much. It is harder when you have no time to mentally prepare. So very sorry about the loss of Puck. Don’t second guess yourself. It doesn’t help, only makes the loss harder. Be kind to yourself. You gave Puck a loving home and a happy life. Poor Puck. I am so sorry to read he passed. Please accept my condolences and virtual hugs. It never is easy. Thank you so much. No, it never is easy. I had the same problem with the late Louie the ginger cat. I realized he was seriously ill after hours. I tried to get him in with the veterinarian on emergency duty, but he was on call to treat a cow and his regular veterinarian (specialist in small animals) was at a basketball game his son was in. I was distraught! I made a video of Louie as he was, describing what I’d observed up to that point, but it quickly became obvious his veterinarian was unlikely to see it before I got Louie in to see him. I found him next on the floor in the living room. I lie down next to him, putting my hand out where he could touch it for comfort, and went to sleep there. When I woke up in the morning, I was alone. He’d somehow climbed up into the dryer of a stacked washer-dryer, his favorite place to sleep. I was not able to view your video from my phone. I will try to remember to look at it on my home computer when I can. I imagine it must be pretty tough when you know your cat needs help and you can’t get it. It is just a slow motion video of a live Louie, happy and being a kitty in the dryer, a short text detailing how it was Louie’s favorite place in life, and where I found him in death. The final “scene” is Louie looking up at me from a resting position and meowing. It tears my heart out to hear him, but it’s the only record I have of how he sounded. He had lymphoma. His veterinarian told me I couldn’t have found the swollen lymph gland that ruptured and filled him with an infection because it was under the spine. That helped a bit because I felt I hadn’t done enough to save him. My cats have always died at the vet’s office. I consider myself lucky that I never had to go through that at home. One did, and one didn’t. Finding Louie dead was much harder than Freckles, who died after spaying. She was having difficulties after the surgery, and they kept her over night. They called me the next morning to let me know she died during the night. An autopsy showed nothing. She was cremated and, at my instruction, her ashes were scattered under a tree in from of the clinic. On the other hand, finding Louie dead, I took him in to the clinic to have him cremated after an autopsy. I have his ashes. I guess it is hard either way. My human and I were so heartbroken about Puck when we found out yesterday. You clearly did everything you could, and I think the vet did too – everything Connie said is true and we feel the same way. Thank you so much. It is so good to have friends like you. I am so sorry to hear about Puck. It is sad and he”ll be missed. Please don’t blame yourself, he was very lucky to have such a caring friend. Pingback: Rest in Peace Sweet Puck - Baptize A Cat? Oh, poor Pucky ! I am so, so sorry that this sweet boy left so soon. It is possible his problems came from something that no one could find – a hidden cancer. There is not necessarily a fault to be assigned Poor sweet baby ! And purrs for you and your wife and Pucky’s fursibs. Chris, I was so sorry to read this post. As other followers have said, please don’t blame yourself,! You are one fantastic cat lover and cat owner, who always puts his cats’ well-being and health first and foremost. Thank you, Claire. I do try to keep them healthy but there is quite a learning curve. Poor Puck, we are so sorry for your loss. We all will remember Puck, one special member of your cat family. Thank you, Robin. I was shocked too when you lost Cinco. Thank you. I have been slowly learning more and more about pet health but there is still so much I don’t know. No pet parent starts off knowing everything they need to know. That’s right. Mommy says ya’ do the bestest ya’ can with the knowledge available to you at the time. And even doctors don’t know everythin’. Sometimes God just needs a fur baby back. It ain’t fair and it ain’t easy fur those of us left behind, but at least we can take comfurt in the fact that they aren’t in any pain any more. Big hugs and purrayers. Fly free, sweet Puck. May the Great Cat in the Sky watch over you. We are very sorry Puck has died. May he live in your heart ♥️ forever. . .
Do NOT blame yourself or the Vet. He will always be in my heart. Thanks. I’m so sorry you lost your little Puckie. 😢 I’m crying and I didn’t even know the little guy. So so sorry. Thank you for letting us know. You may be second guessing so many things … Just know you loved him and little fur bears are mysterious creatures. I didn’t expect to read this kind of news. My thoughts are with you and Rose …. And your other kitties. It was very unexpected. Thank you for your nice words. Thank you, Janet. You are so nice. MY CONDOLENCES ON THE LOSS OF YOUR PRECIOUS FAMILY MEMBER, PUCK. I KNOW YOU ARE HURTING. I’VE LOSTA CAT THAT I’D HAD FOR15 YRS. HE WAS MY BABY. IT WAS TOO PAINFUL. I PRAY YOU & YOUR FAMILY FIND PEACE IN THIS DIFFICULT SITUATION. Thank you, Sherry and I am sorry for your loss too. Pingback: The Cat on My Head’s Sawyer shares a “mad” Sunday Selfie & honors Kit. So very sorry for your loss…. We are so very sad to hear that dear Puck has passed. At such a young age it is always hard and it is so difficult not to think of all the things that, in hindsight, you could have done. You did so much for Puck and most of all you loved him dearly. That love came though to him every day and he is looking down with fond memories and knows you will all meet again someday. We so enjoyed reading about Puck and all your family. He will be missed by us all. Thank you so much. Puck will be missed. We are so very sorry to hear about your dear Puck. Don’t beat yourself up, the love for your sweeties is so obvious and you do your best all the time. We lost 2 in the past 4 months, we understand. Hugs from all of us. Daisy Mae and I didn’t know Puck for very long but we will help you remember him. So sorry you lost Puck. that’s so sad. Thank you. At least his short time here was good. I am so sorry. I kept thinking that he would get better. It never crossed my mind how stressful all of that would be for him. I can’t imagine that anyone could have done more for Puck than you did. Thank you. We assumed that he would get better when we dropped him off at the vet. We did do a lot for Puck but we missed something. More likely than not, the vet missed it. Like with other doctors, we have a tendency to trust. And they have a tendency to go with their own experience.